Looking for houses with the best Christmas light displays in the Champaign-Urbana metro area? Check out our list of Amazing Christmas Lights Around Champaign-Urbana and Beyond to help you plan a night with your family that’s fun, festive and free! We’re just getting started here, so be sure to come back here in the next few weeks as even more displays pop up. So pack some snacks, fill up a thermos with hot cocoa (or a sippy cup with chocolate milk for the toddler crowd) and head out on a mission to find the best decorated houses in the Champaign-Urbana metro area. 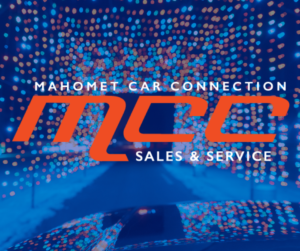 Thank you to our sponsor, Mahomet Car Connection, for providing this guide this year. Memories are made in the family vehicle. It can be as simple as piling everyone into the car with a thermos of hot chocolate and driving around to see the community’s lights. At MCC, we want your family to not worry about transportation, but instead focus on the moments that last a lifetime. So this holiday season, bundle up, map out your holiday lights trip, and enjoy the memories. From all of us at MCC, Happy Holidays! Click here to meet Mahomet Car Connection and get more information. Want to know all things holiday in Champaign-Urbana? Sign up for our Ho Ho Holidays email newsletter every day from December 1-24. Click to sign up today! Want more lights? Check out our Central Illinois Christmas Lights Trail (those displays are a bit farther away). New this year: we want to see your lights pics! Tag #ChambanaLights on Instagram or Twitter. 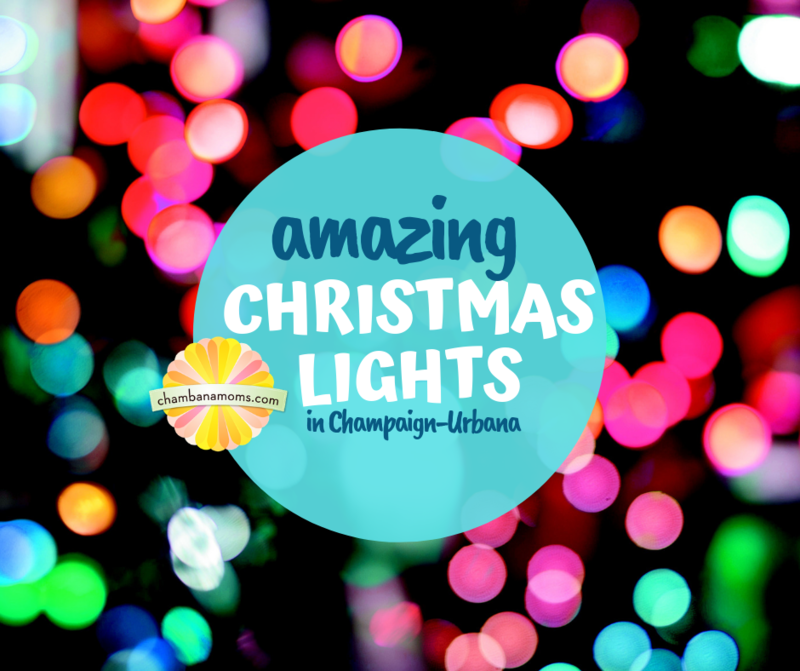 Also new this year: download our FREE Christmas Lights in Champaign-Urbana Scavenger Hunt. Another way for your family to enjoy the lights! This list of where to see lights is crowd-sourced from both chambanamoms.com team members (a certain person who might be obsessed with lights) and reader comments. We ask on Facebook for recommendations, if someone tells us there is a great display at X address, we will include it. We can’t drive around to every location to verify a light display, and what some people think is worth-the-drive display, others might not want to bother with, so please use our list with that in mind. We try to include details and pictures to help as well! Addresses without an asterisk and bold are verified listings, meaning either a Chambanamoms team member has seen it in 2018 or a friend has told us the display is up for 2018. ** Addresses with double asterisks are unverified locations which mean they have previously had displays but have not been visited by us yet in 2018. If you have seen one of these sites, please let us know in the comments so we can keep this post updated. Thank you! We’re aware of a few area favorites that WILL NOT have lights this year, including Lighting Up the Croft in Champaign and Lighting Up Paxton. If you know of an area or a certain house that should make the list, let us know; drop us a note at editor@chambanamoms.com. We will be updating the list all month long. Happy light hunting! A Champaign-Urbana holiday tradition for more than 50 years, Candlestick Lane will light up on Saturday, Dec. 8, this year. After that, Candlestick Lane (aka Grant Place, located between Cottage Grove and Philo roads, and north of Florida Avenue) has its lights on from 5 p.m. to 10 p.m. nightly through New Year’s Day. Drive cautiously and turn off headlights to get the most enjoyment from the lights. Several streets and neighborhoods around Candlestick Lane have the bug too. Start with the beautifully lit trees at Champaign Country Club. There are a few houses around Clark Park that are pretty too, including the large tree in the Park. Go a little further south on Prospect for a few more fun houses just past Devonshire (turn left on Mendota). NEW to our guide this year: The 1109 Kirby Light Show. Missing a holiday lights show synced to music? There’s a new one at 1109 W. Kirby Avenue, two blocks west of Prospect. The challenge of seeing this display is Kirby is a busy street. But the good news is that Kirby isn’t as busy in the later evening (or on the weekends). Our recommendation: come up to the house going east on Kirby (just east of Lincoln) and put your hazards on. Tune into 93.1 on the radio; the show lasts for at least six songs. The one my kids liked the best was the Polar Express. Some fraternities at the University of Illinois are active with Christmas lights. The most notable house, which is worth a trip, is Alpha Gamma Rho at the corner of First and Gregory in Champaign. Note that these houses often turn off lights when they leave school for winter vacation, so that’s typically well before Christmas. 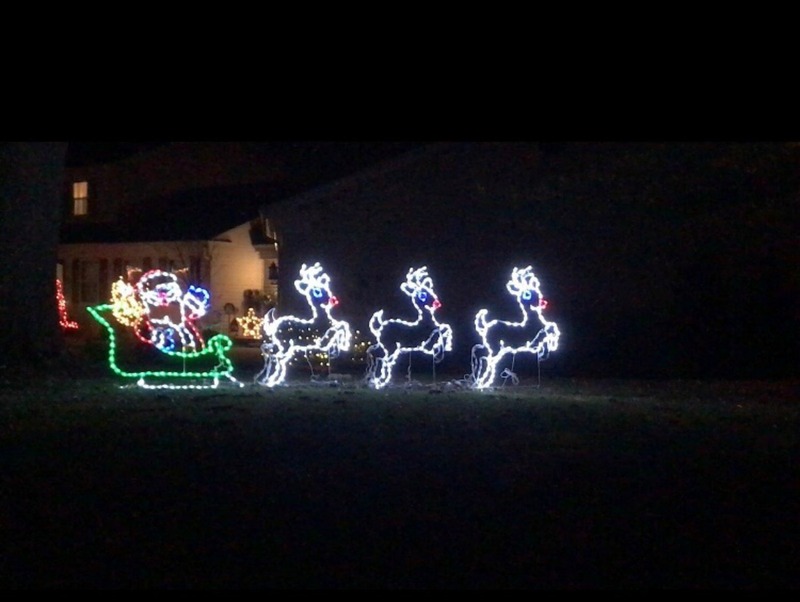 Prairie Fields, the neighborhood located around Carrie Busey Elementary School, has many fun lights displays and houses with popular characters including a large Olaf and the Peanuts gang. Take Old Church Road to Prairie Rose, and drive up and down the streets there. From Old Church Road at Golfview you can see a home that has a fun display in its backyard, complete with moving pieces. Then go north on Wesley Avenue, and head to Meadowview Court for another lovely cluster of homes with lights. There is a pocket in the northeastern part of Cherry Hills that is once again very festive. Individually, none of the houses is spectacular – but all together, it makes for a fun drive especially if you are in that part of town. You’ll see Santa on top of the roof, Mickey Mouse, and blue trees. Take Windsor to Cherry Hills Drive, then Applewood to Woodridge. Check out Cherry Creek, Worthington, Woodridge and Wedgewood roads. Characters — from the Peanuts gang to R2D2 and Yoda to animals and more — cover the lawn, and it’s worth the trip to Ironwood to see it. In the 1800 block of Vale Street, in far west Champaign. The popular Clark Griswold House holiday display, located at 701 N. Timberview, boasts lights everywhere — all over the house, in the front yard, the back yard and wrapped around two-story Evergreen trees. It includes a Santa village, a toy shop, Alvin and the Chipmunks singing, and much more. The Griswold House isn’t the only reason to visit Mahomet on a lights quest. Love superheroes? The Dodge house on 206 N. Spruce Drive in the Lakeview subdivision off of Tin Cup Road is a MUST SEE, and there are several houses in that neighborhood that are worth seeing. This year in honor of the passing of Stan Lee (iconic comic book creator) they have added a donation box in the display. All donations will go to the Stan Lee Foundation, an organization that promotes literacy. Here’s a video of The Dodge house. Don’t forget to check out the light show on Red Bud Court as well! We have yet to visit this display, but wow. Check out the video! Not only can you drive by, you can walk through it. Ohemgee. About 35-40 minutes away. A lighted archway tunnel is one of the many features of the McIntosh Christmas Light Show in Monticello. Photo by Brian McIntosh. Between the Polar Express and other events, Monticello is quite the capital of Christmas. 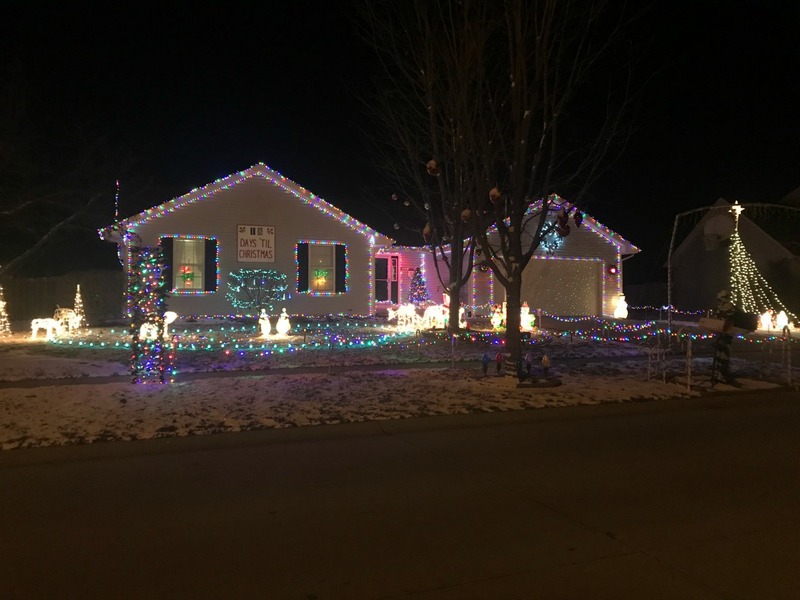 What started as a “friendly” competition between siblings has led to a major holiday light show that just keeps getting bigger and better each year. The McIntosh Christmas Lights Show, located at 404 S. Charter, Monticello, is live. Hours are 5-10 p.m. Monday through Friday and 5 to 11 p.m. Friday- Sunday. Sadly, the family has announced this will be the last year of the McIntosh Christmas Lights Show, after its founder passed away from cancer this fall. All donations this year will be donated to cancer research. Once again, Allerton Park has its own lights display thanks to a partnership with Kirby Medical Center. Enjoy an enchanting stroll of lights from the Mansion parking lot through the Avenue of the Formal Gardens and Brick Wall Garden to the Visitor Center. The Kirby Winter Wellness Walk will be open Tuesdays-Saturdays from 5-8pm until January 6 to help you stay moving this winter. The special kickoff event for this is Dec. 7. Located in Ogden, this house sparkles in the dark country night. Children who live in and near Odgen will tell you this house has the best lights! To find this home (it’s not hard to find!) you turn South on Highway 49 when you take exit 74 at Ogden. Drive slow heading south and you will see it on your left. The House on 1406 East Grand Ave., St. Joseph has an amazing light display and is definitely worth going to see! The House at 402 N. Cedar, St. Joseph also has a pretty amazing display this year including a countdown clock! The lights at 402 N. Cedar in St. Joseph, Illinois. Photo Credit: Nora Maberry-Daniels. Who said the only reindeer in Rantoul were at Hardy’s? 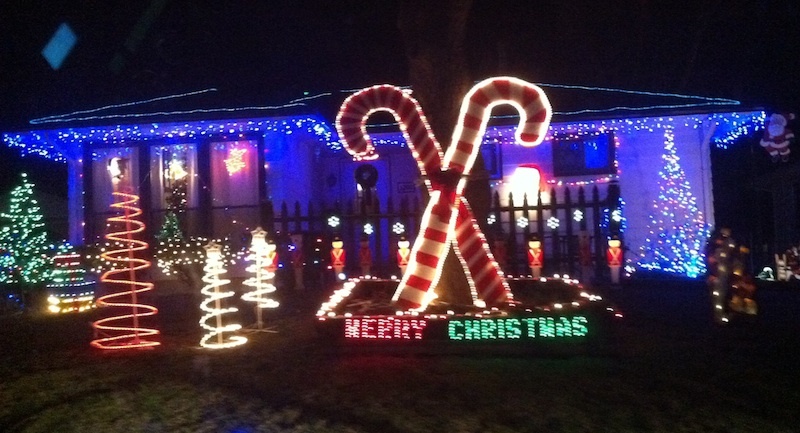 For another neighborhood that really gets into showing its Christmas spirit, check out “Candy Cane Hills” in Rantoul. You’ll see a wide variety of traditional displays as well as inflatables (Santa on a boat? Why not?) some reindeer, including a special display of Santa with Rudolph and friends; and lots and lots of candy canes. For more Christmas beauty in Rantoul, many houses on Champaign Avenue – the main drag into town – are festive as well. Easy to get to and not far from the Interstate, if you’re coming from Champaign-Urbana. Take Champaign Avenue (Route 136) west to East Drive, just past the McDonald’s. Follow East around until Indian Hills Drive. Candy Cane Hills includes Indian Hills Drive, Niepswah Drive, and surrounding streets. A display at Candy Cane Hills in Rantoul. Photo by Chambanamoms. This community lights display is located in Tilton, which is just west of Danville. Get there by heading east on I-74. The lights will be on Dec. 7, 8, 9, 14, 15, 16; starting Dec. 21 t it will run every night until Dec. 31. Times will be from 6 p.m. to 10 p.m. every night. They’ve added several new displays to the event. Lights fans, it’s worth your while to make the trek to Hoopeston – yes, Hoopeston. Come drive the mile long loop at McFerren Park and experience an unforgettable light display, named one of the top in Illinois. Tens of thousands of lights and dozens of displays will guarantee a night you won’t soon forget. Every evening, now through New Year’s Day, from sundown until 11 p.m. at McFerren Park. Enter from Elm Street entrance. Admission is free. While you’re in Hoopeston, check out the Thomas’s Light Show at 928 West Penn St. on the corner of 9th Avenue and Penn. 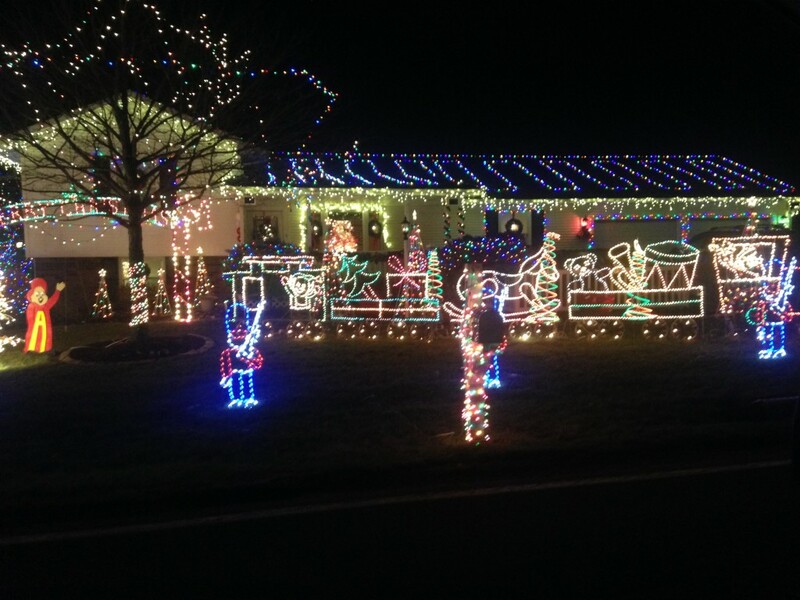 More than 100,000 lights on three houses and controlled by Light-O-Rama! Want more lights? 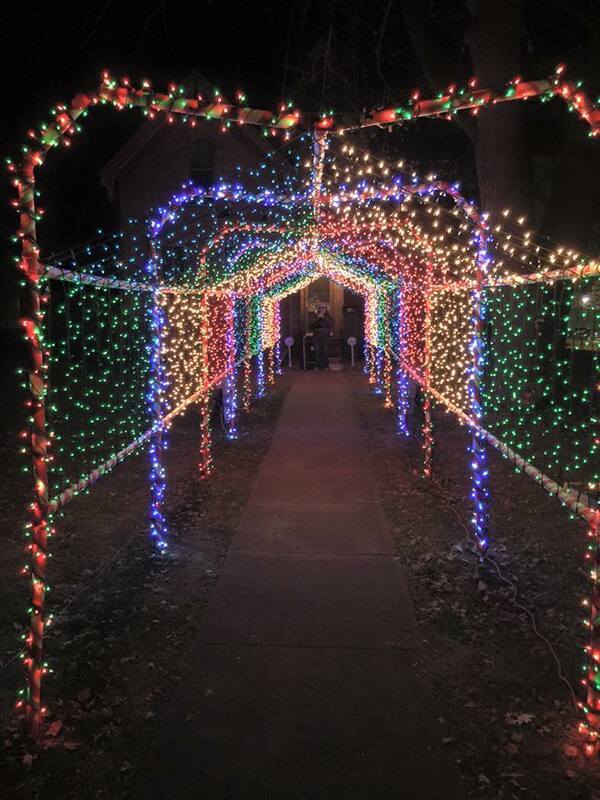 Check out our Central Illinois Christmas Lights Trail. What displays or neighborhoods have we missed? Let us know in the comments or email us – editor@chambanamoms.com.